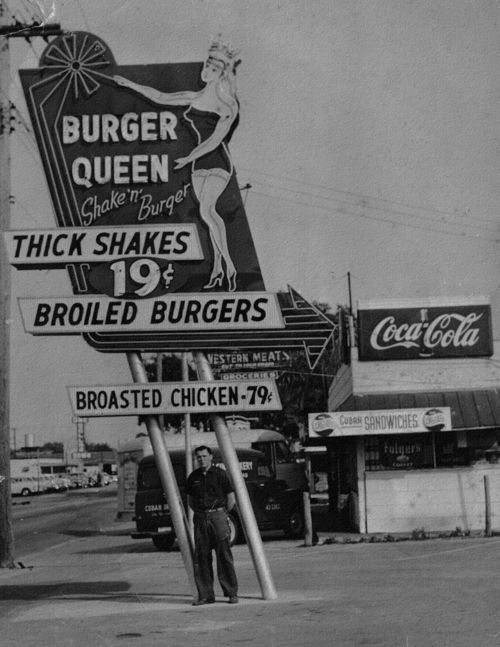 Druther's traces our history back to 1956, when Harold and Helen Kite opened the first Burger Queen restaurant in Winter Haven, Florida. 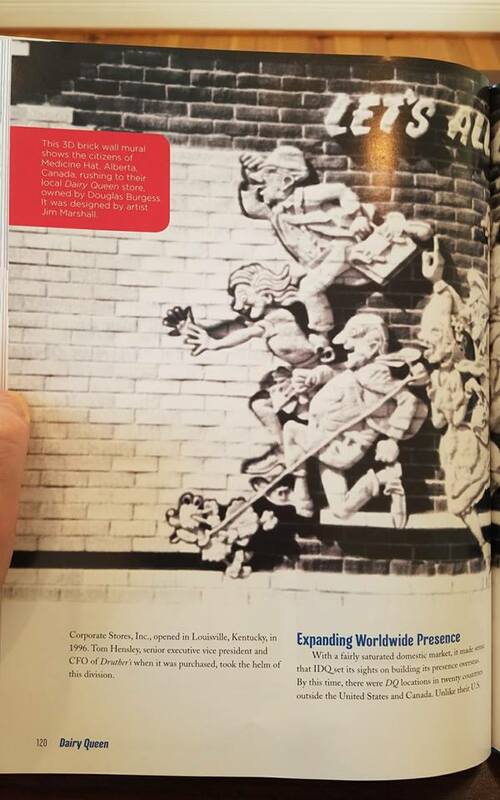 In 1961, business partners George Clark and Jim Gannon bought franchise rights and permission to expand the chain to Kentucky. 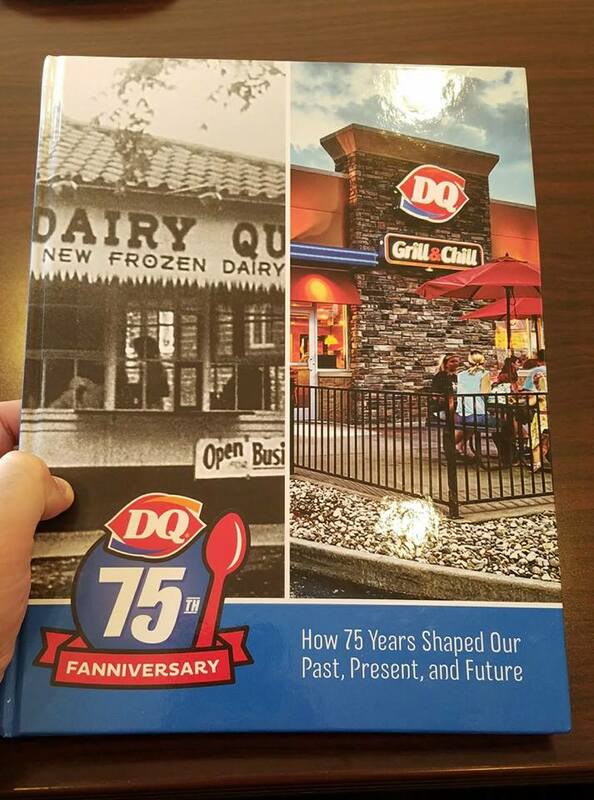 Druther's, headquartered in Louisville, Kentucky since 1961 and headed by Robert Gatewood and Brian Easley, is proud to currently partner with and provide support to locally-owned and operated Dairy Queen® restaurants. Our company recently turned 60 years old. 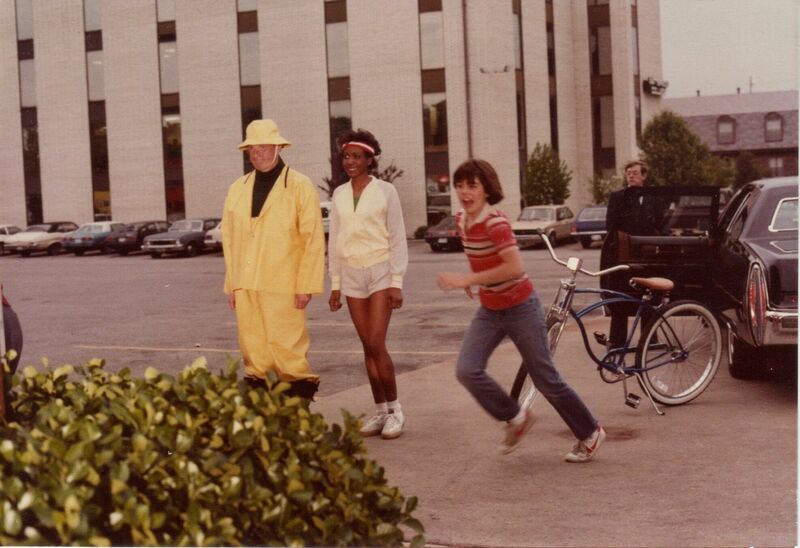 In those six decades, we've created over 350 businesses in multiple states and countries. We look forward to the next chapter of the Druther's story, and we thank all of those individuals and families who have been a part of the company, or who we have had the privilege of serving at our restaurants. 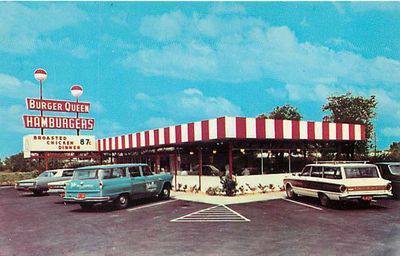 1956: Harold and Helen Kite moved from Missouri to Winter Haven, Florida to open the first Burger Queen restaurant. 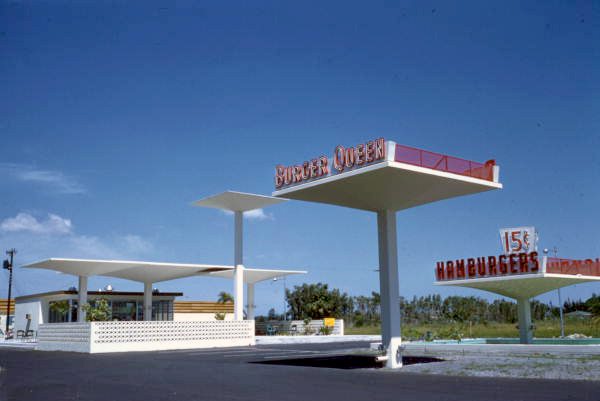 Burger Queen of Winter Haven was born The company would later be called Burger Queen Systems. 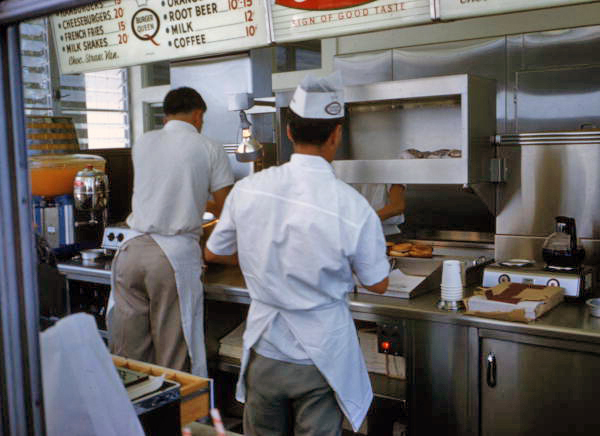 Helen was the original Burger Queen, and was the operator of the restaurant, while Harold focused on business and franchising. 1957: The Florasota Distributing Company begins seeking franchise partners throughout Florida and surrounding states on behalf of Kite. 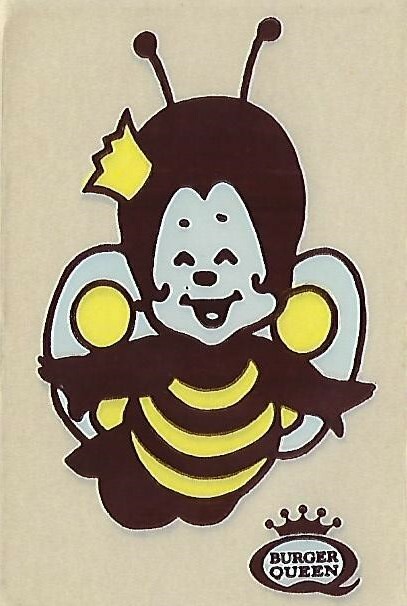 1961: The Florida chain, owned by Harold Kite, grows to 16 locations across Florida. 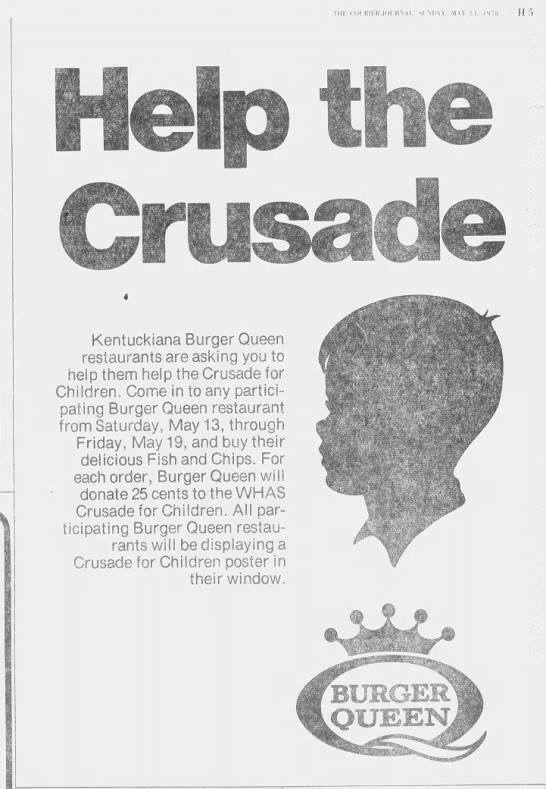 Jim "Mick" Gannon, a friend of Harold Kite through the Taylor Freezer business, and his business partner George Clark, paid $5000 for franchise rights and permission to bring Burger Queen to Kentucky. 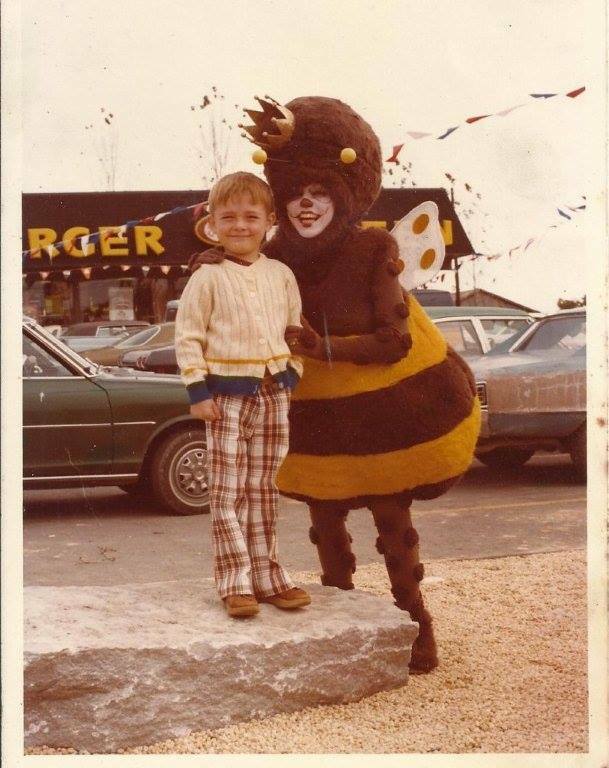 Burger Queen of Louisville was born. 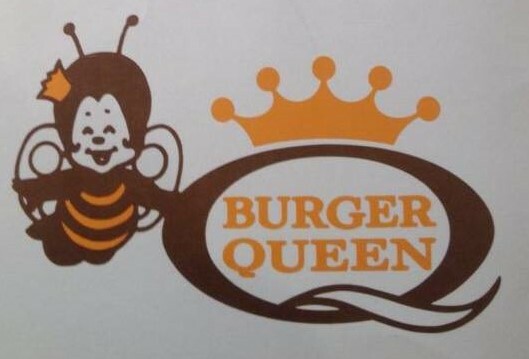 The company would later be called Burger Queen Enterprises. 1962: Funding is secured and site chosen for Gannon and Clark's first Kentucky location in the Middletown area of Louisville. Construction begins on the site in late 1962. 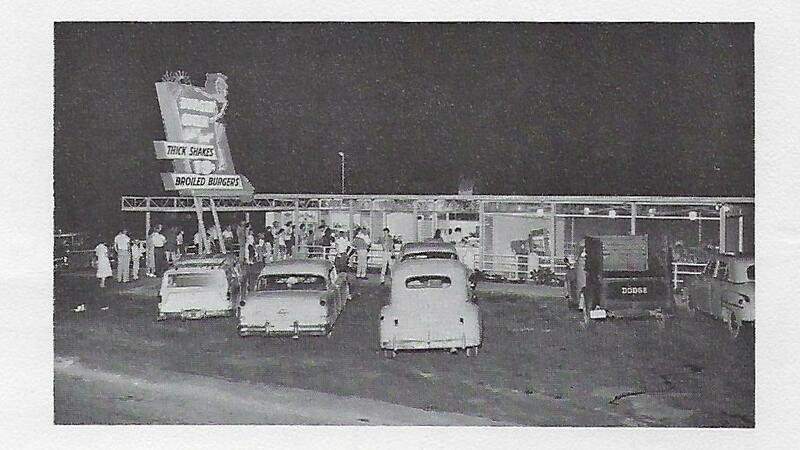 1963: Our first Kentucky location opens on September 23rd in the Middletown area of Louisville, Kentucky. George Clark's brother, John, would come on board a few months later. 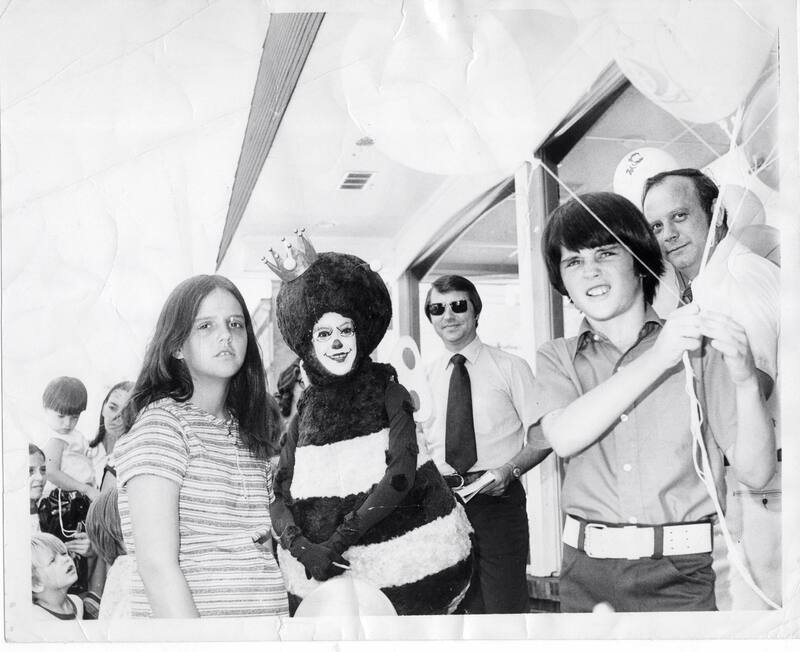 1965: A young man named Michael Kull joins the ranks, and begins his career as one of our longest-serving executives, as well as President and CEO of Dairy Queen Corporate Stores from 1999-2011. 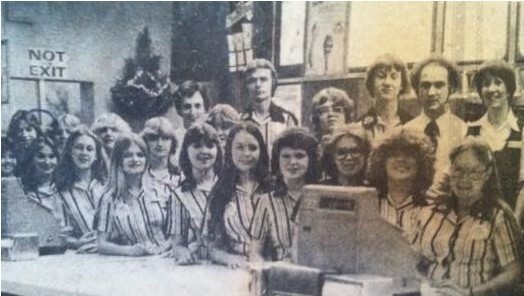 Another youngster, Ron Colyer, who would later become an executive and franchisee, as well as lead the Royal Equipment Company, would also join the staff of the first Burger Queen in Middletown, working on the front line. 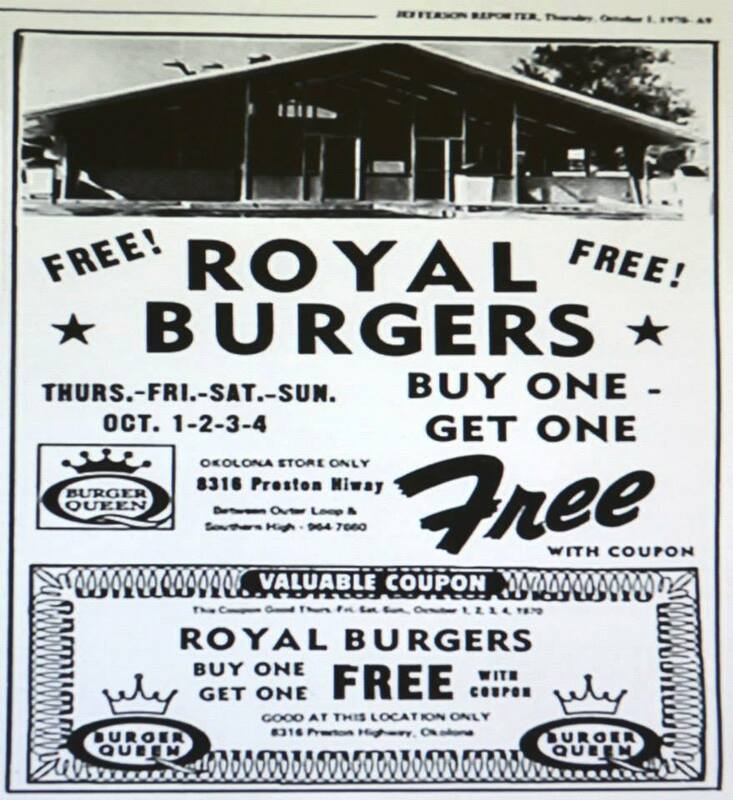 1969: The Middletown location of the first Kentucky Burger Queen with the old building model is closed. 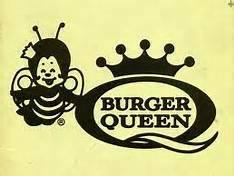 The new Burger Queen, featuring the now classic construction model, opens across the street at 11806 Shelbyville Road on July 21st. 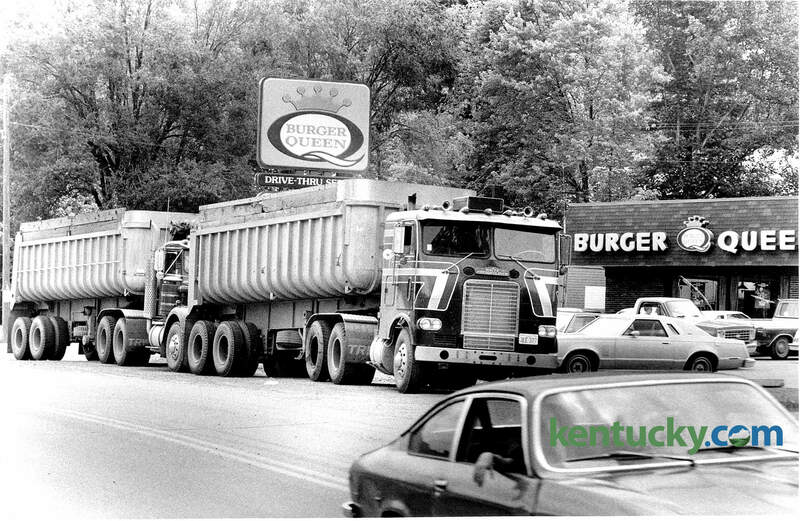 1970: Jim Gannon and John Clark of Burger Queen Enterprises of Kentucky depart the company. 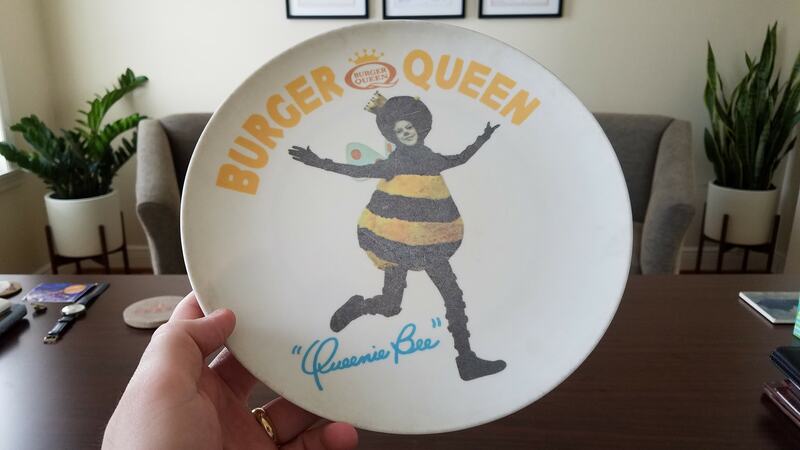 1971: Joe Bonura, a young ad executive, created "Queenie Bee" for Burger Queen - the beloved mascot of the chain of restaurants. 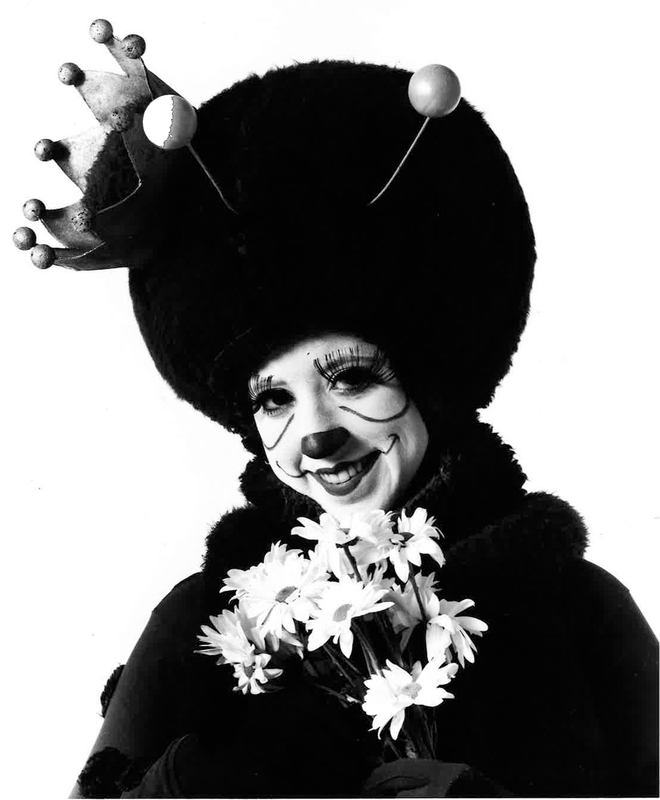 Queenie was most notably portrayed by actresses Joyce Murphy and Susan Bandy. 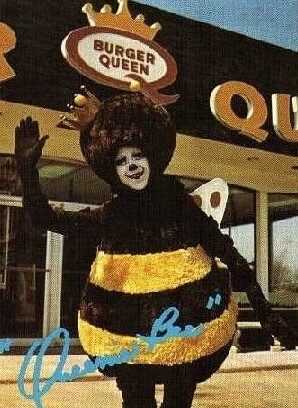 Queenie's nemesis was a Mr. John B. Catcher, and "Let's All Follow Queenie Bee, it's Burger Queen For Me!" 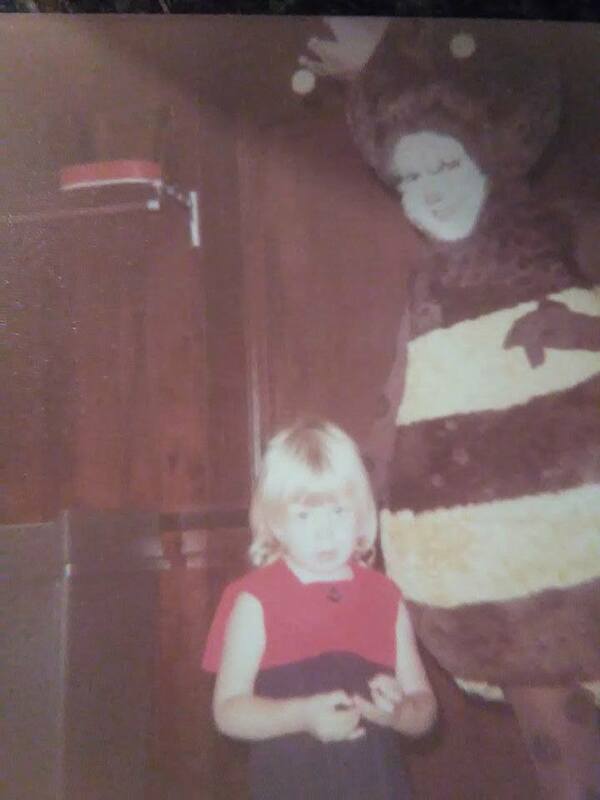 was one of our popular jingles. 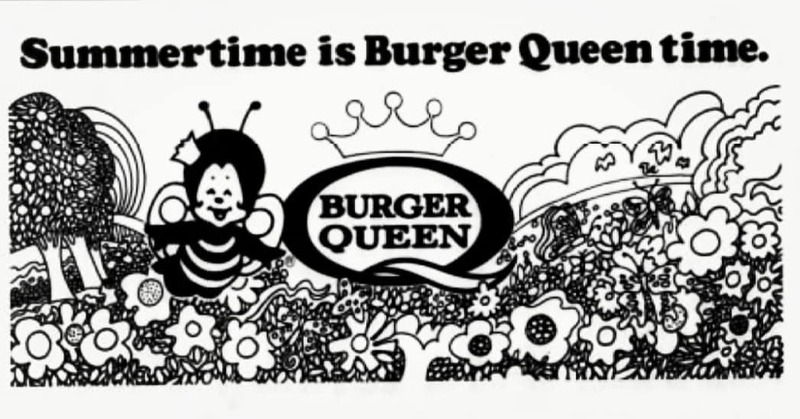 1972: Joe Bonura forms the Bon Advertising Agency, and spends more than a decade with the Burger Queen, and later Druther's Restaurants, account. 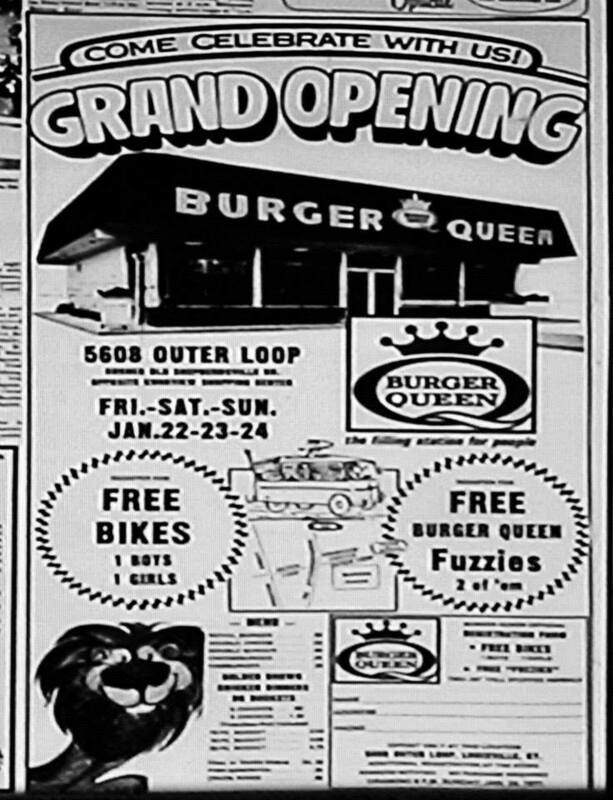 1973: Burger Queen Enterprises of Kentucky opens its 50th location on December 15th. Michael Kull is promoted to Executive Vice President. 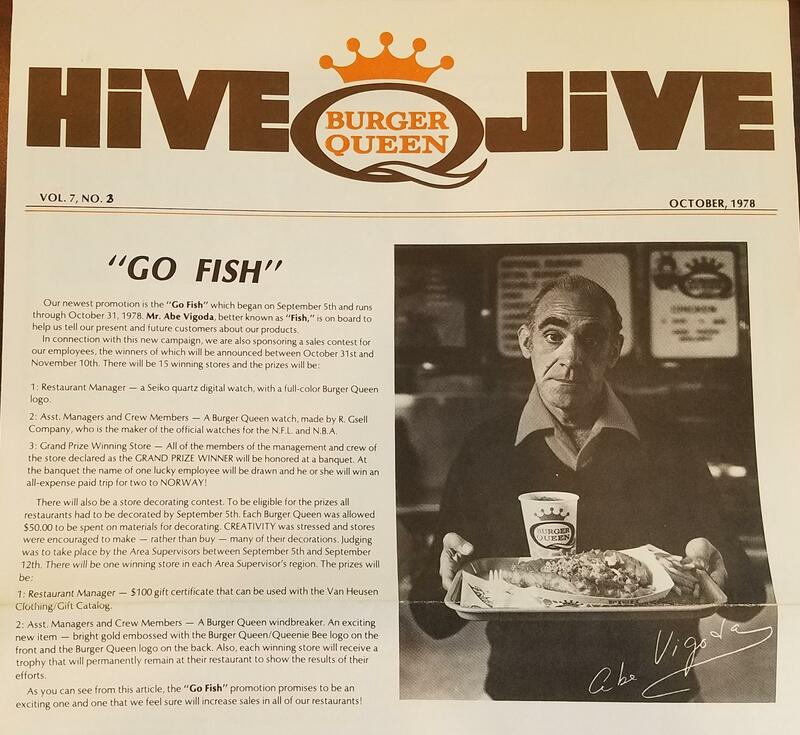 1974: Burger Queen begins publishing "The Hive Jive" corporate newsletter for our Kentucky group of restaurants and "The Beeline" corporate newsletter for our Florida group of restaurants. 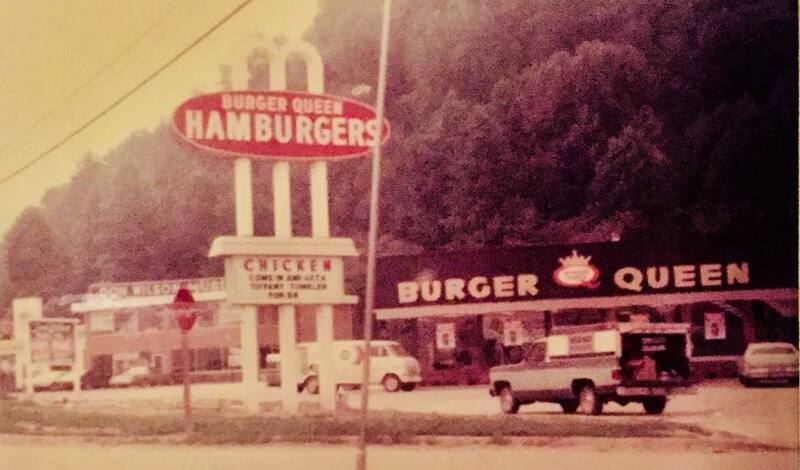 1975: Tom Hensley opens his first Burger Queen in eastern Kentucky on May 24th. 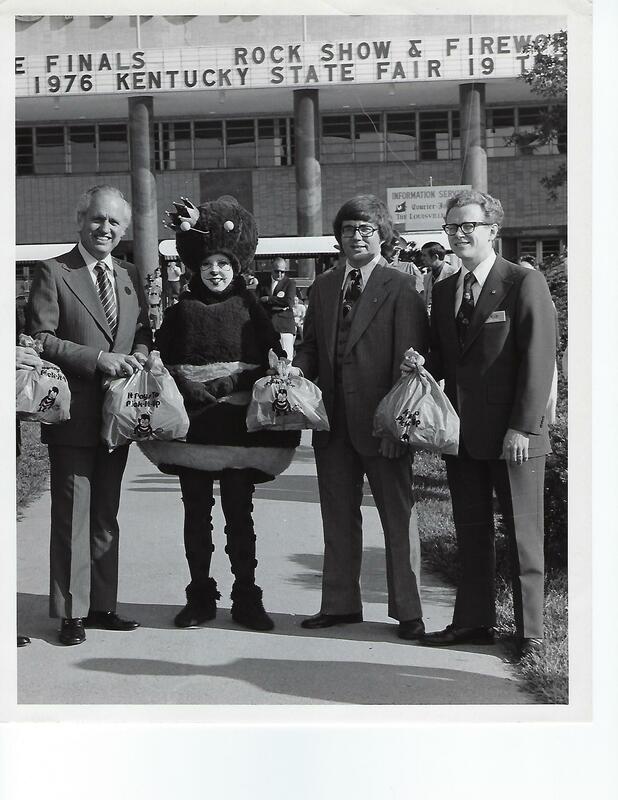 Hensley would later acquire the company from Clark and Kite with his business partner and Burger Queen general counsel, Robert Gatewood. 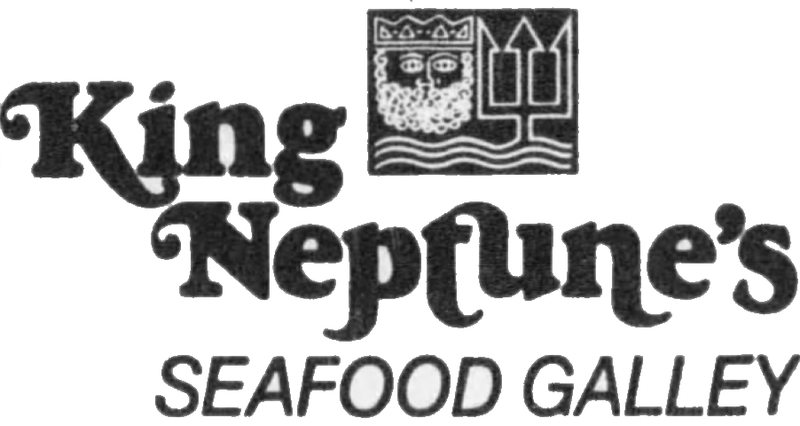 1976: Burger Queen Enterprises opened King Neptune's Seafood Galley in Louisville, hoping to enter the seafood segment of the fast food industry. To emphasize the company's focus on quality beef, George Clark buys the Grand Champion steer from the North American Livestock Show. The 1,255 pound steer was purchased by Clark for $3,890.50. The chain had 65 locations in the Kentucky-based group. 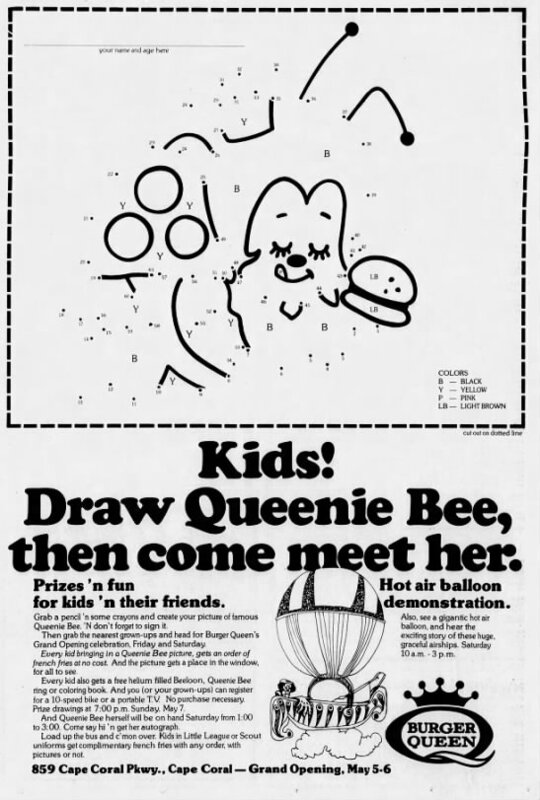 1977: Burger Queen begins search for overseas franchise partners to take Burger Queen and Queenie Bee across the globe, the company meets with businessmen from across the Pacific and Atlantic. 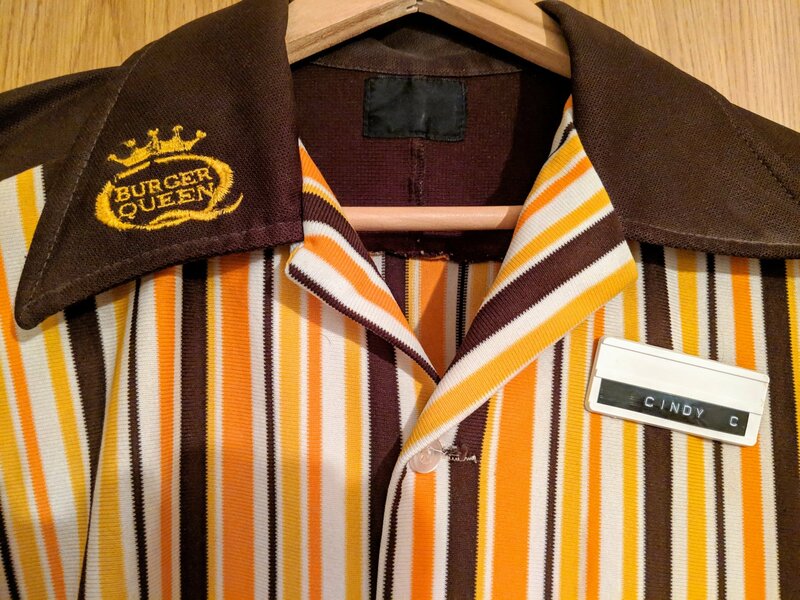 George Clark and Harold Kite make Tom Hensley third partner and Vice President of Burger Queen Enterprises in July. The Florida-based company maintains 16 locations and is poised for further expansion. 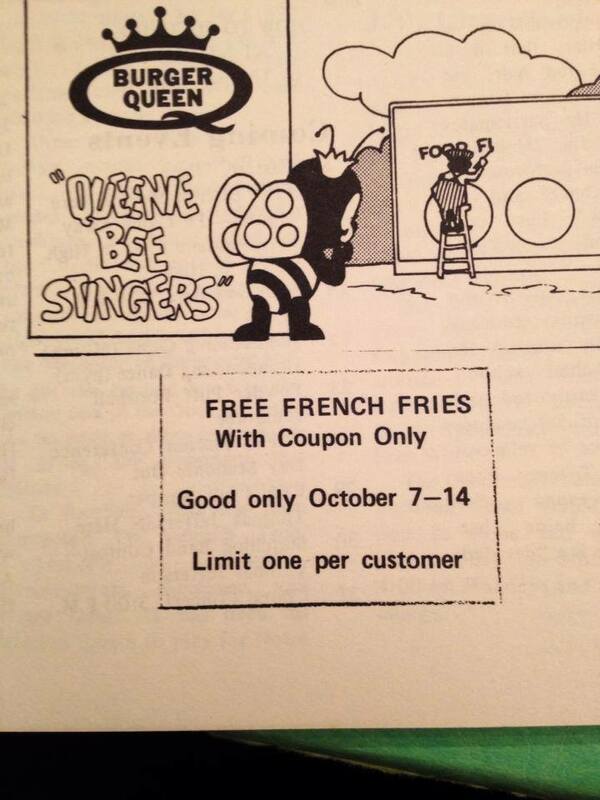 1978: Burger Queen goes global. Our first international locations open up in Red Deer, Canada and Taipei, Taiwan. 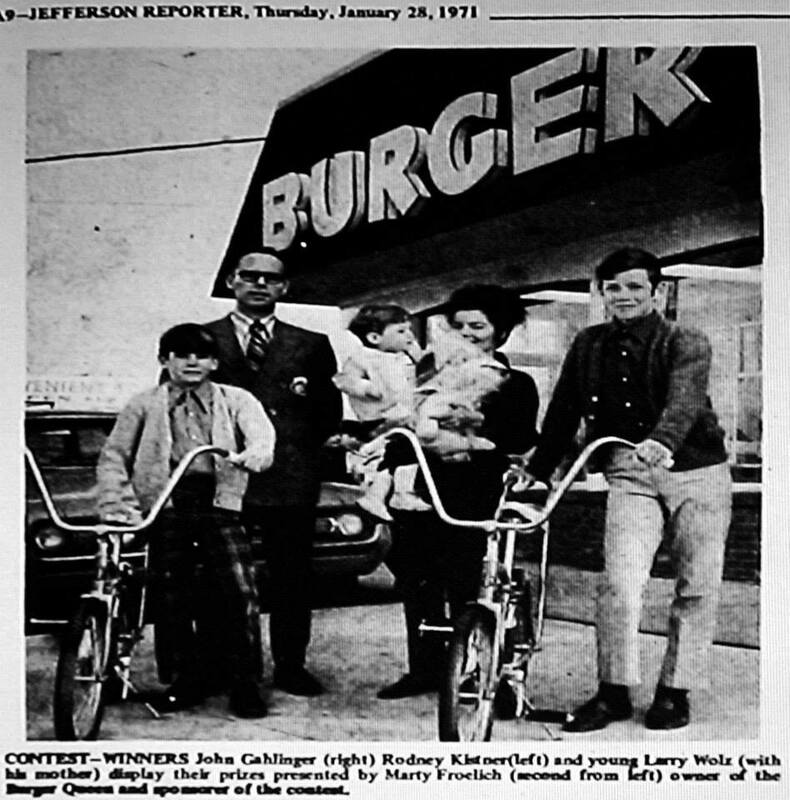 1978: Robert Gatewood joins Burger Queen as general counsel, a position he retained for over 40 years. Gatewood would later acquire the company from Clark and Kite with his business partner, Tom Hensley. 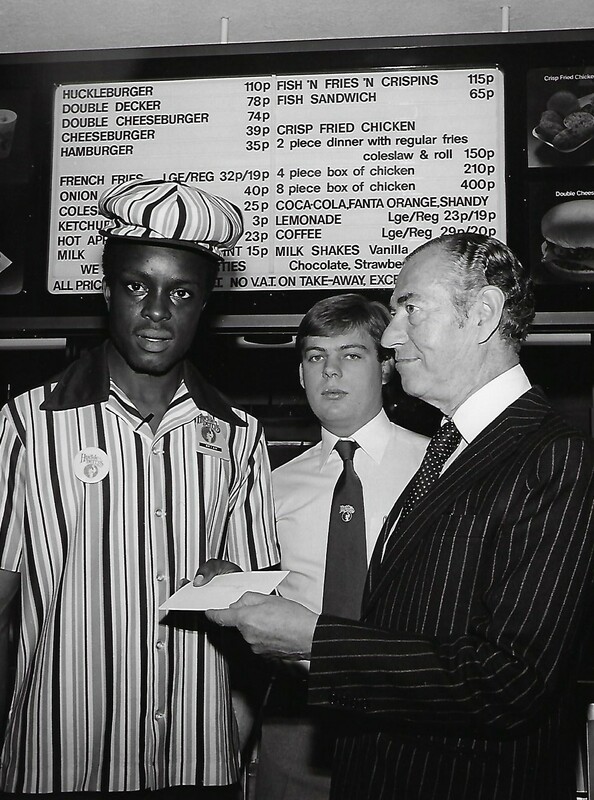 1979: Our first United Kingdom location opens in Wood Green, north London, on October 23rd. Our restaurants would be branded as Huckleberry's, out of respect for the British people and the Queen. Our partner in the venture was Chef & Brewer, a subsidiary of Grand Metropolitan, which would later become Diageo. 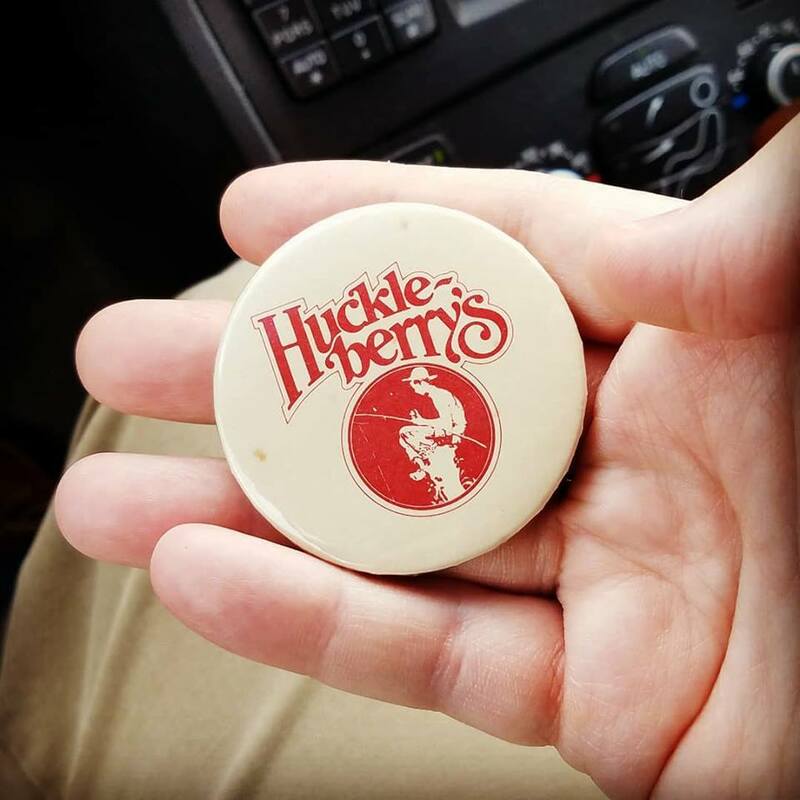 Our Huckleberry's logo, created through our partnership with Coca-Cola, featured a Norman Rockwell painting of "Out Fishin'" that featured a young Huck Finn look-alike with a fishing pole. 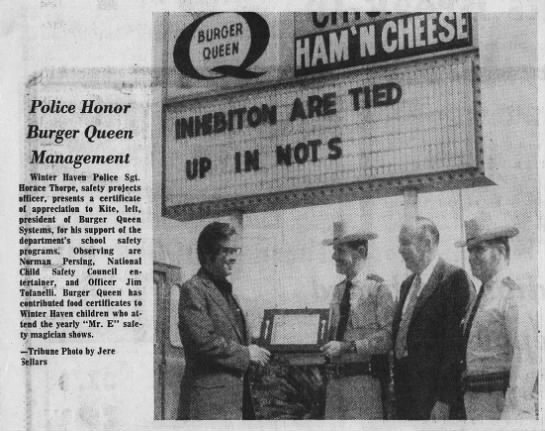 1979: Tom Hensley becomes President of Burger Queen Enterprises. The company begins the search for a new name. Lippincott & Marguiles of New York are contracted, and a list of two thousand possibilities is created. 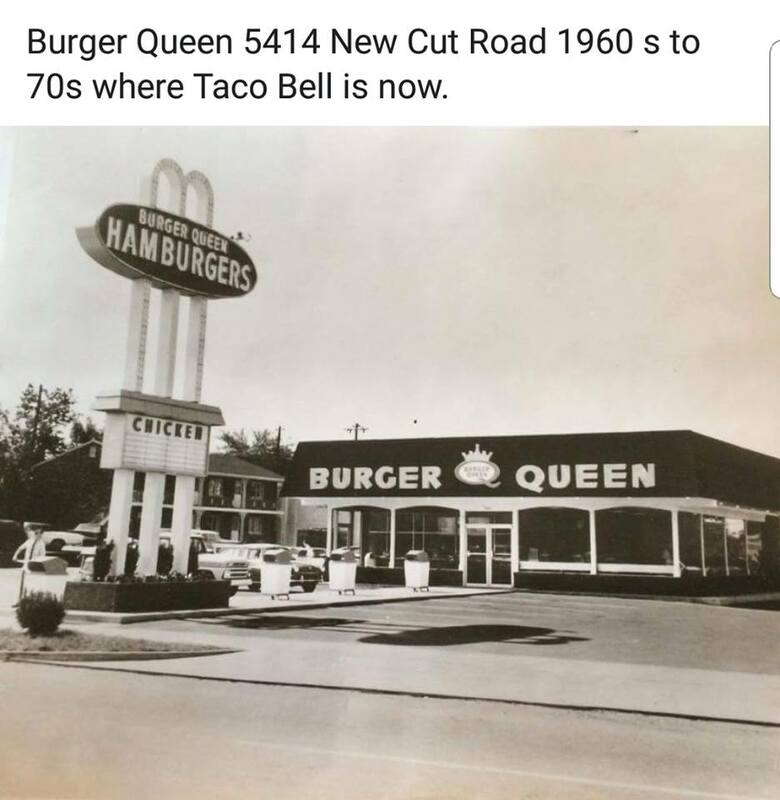 That original list is later whittled down to sixty possibilities, with each name being reviewed by both Burger Queen Enterprises and Lippincott & Marguiles. In December, Clark, Kite, Hensley and Gatewood are provided three new branding options by Lippincott & Marguiles, including the name selection Druther's. 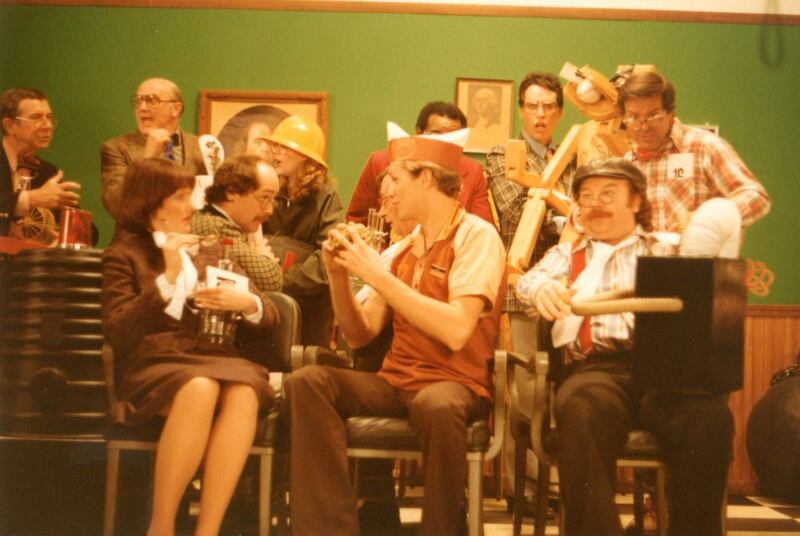 1980: Clark, Kite, Hensley and Gatewood choose Druther's as the name selection for the rebrand. Hensley notifies all franchisees, operators and personnel of the name change on July 25th. The first Druther's Restaurants open in test in Union City, Tennessee and Fulton, Kentucky, using only a simplified, plain type style version of Druther's, and not the iconic Druther's logo and design package that would be introduced the next year. The entire chain completes the rollout of the new salad bar in September. There are 176 locations in the Kentucky-based company group. 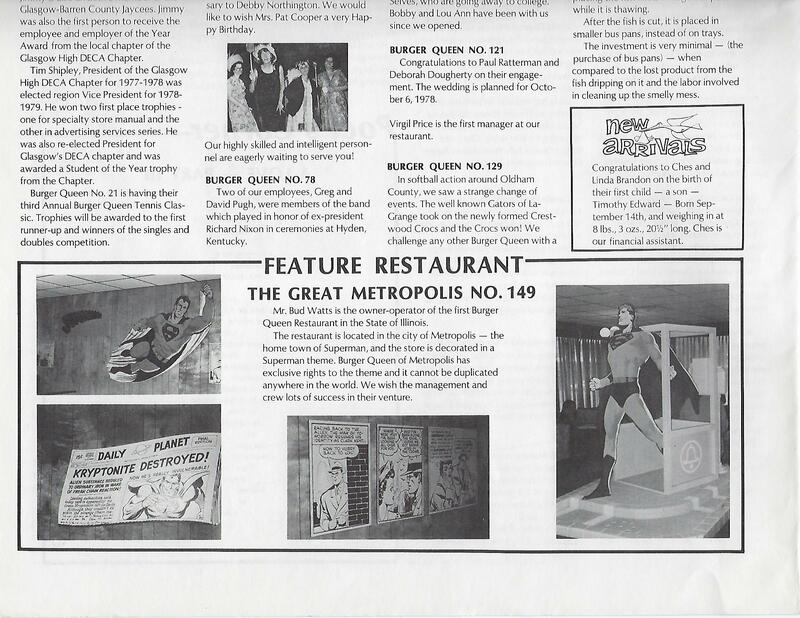 1981: Burger Queen rebrands to Druther's Restaurants with help from Grey-North Advertising of Chicago and Lippincott & Marguiles of New York. Lippincott creates the new Druther's logo. Grey Advertising creates Andy Dandytale. 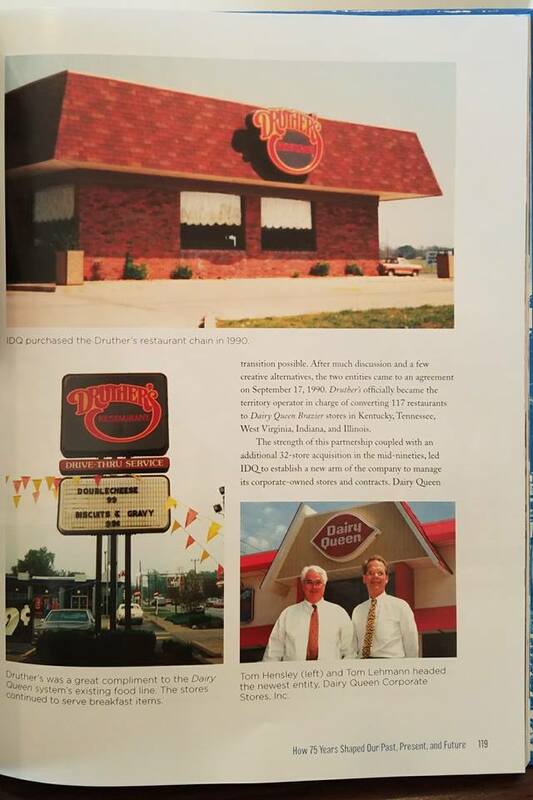 Burger Queen Enterprises of Kentucky, Burger Queen Systems of Florida, and the Royal Equipment Company would all later merge to become Druther's International, Inc. with Tom Hensley and Robert Gatewood in control. 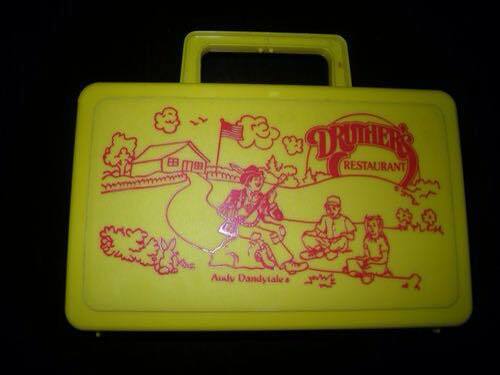 "Andy Dandytale" would become our mascot and "I'd Ruther Go To Druther's Restaurant" became our jingle. Prior to the rebrand, we had operated over 200 company-owned or franchised locations within the United States, from Florida to Missouri, as well as international locations in the United Kingdom, Canada, Taiwan, Kuwait, the United Arab Emirates, etc. 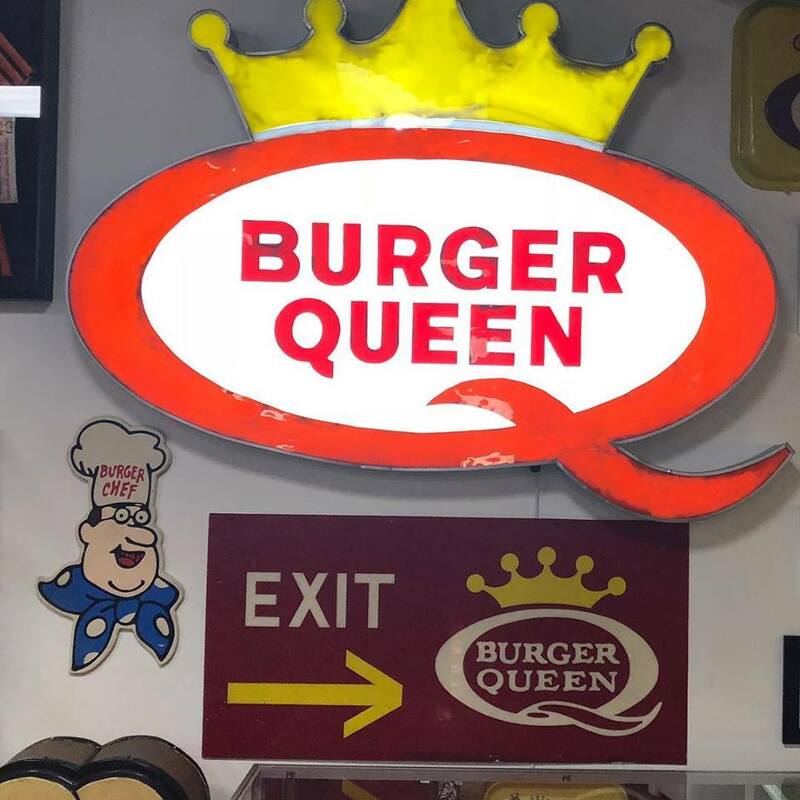 As of 2018, the last independent Burger Queens in the world, former franchises, remain in Taipei, Taiwan. 1982: Tom Hensley and Robert Gatewood acquire the company completely from Harold Kite and George Clark in September. Burger Queen locations in Florida begin closing their doors. Hensley and Gatewood would later approach Canadian Adam Miles from A.B. 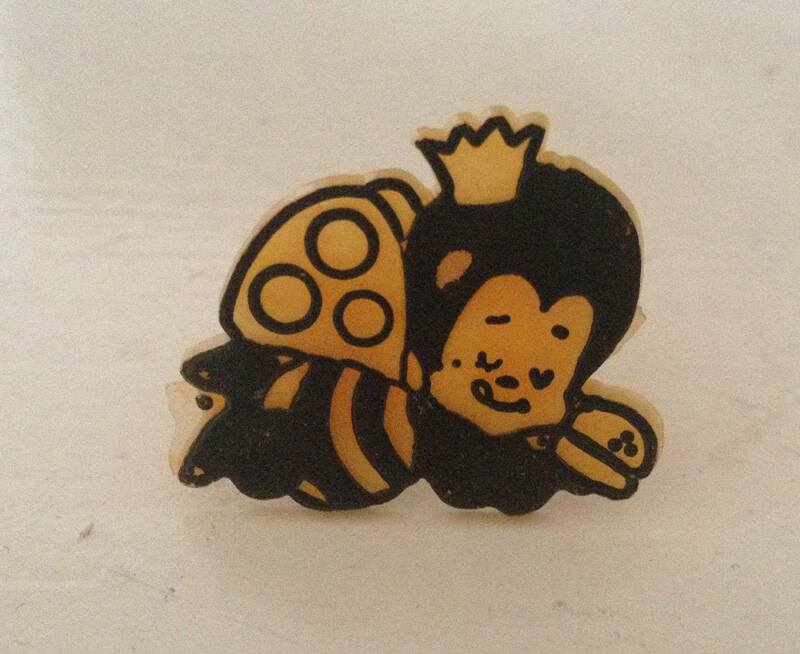 Burger Queen and our Huckleberry's venture in the United Kingdom in regard to becoming the third partner in the company. 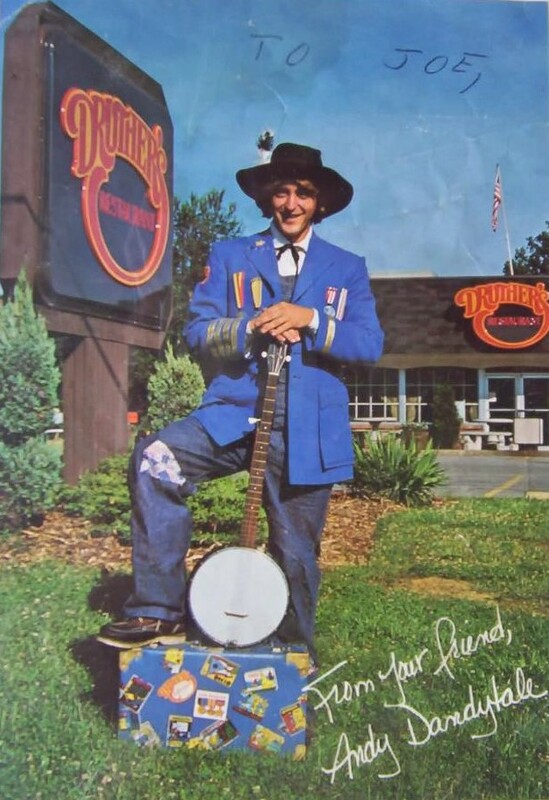 1984: Druther's International and Grand Metropolitan (later known as DIAGEO) reach an agreement to sell their 17 Huckleberry's locations in the United Kingdom to Wimpy Restaurants. 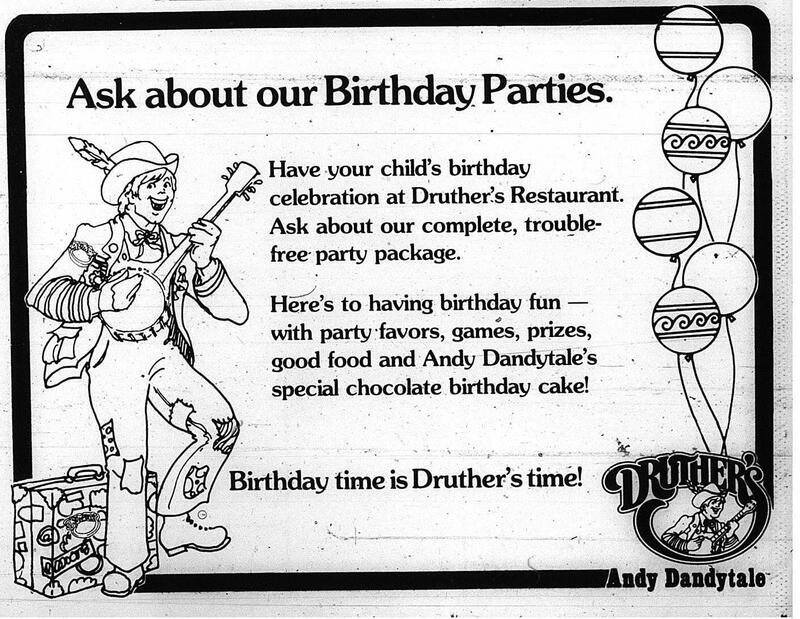 1985: Druther's operates 152 Druther's Restaurant locations in 8 states (Kentucky, Tennessee, Indiana, Virginia, West Virginia, Illinois, Ohio, and Missouri). Hensley and Gatewood of Druther's take steps to acquire The Fresher Cooker restaurant chain after that chain's bankruptcy. 1987: Druther's begins publishing The Front Line, the Druther's corporate newsletter. 1988: Druther's ends our Canadian partnership with Adam Miles of A.B. Burger Queen with assistance from the Royal Bank of Canada. 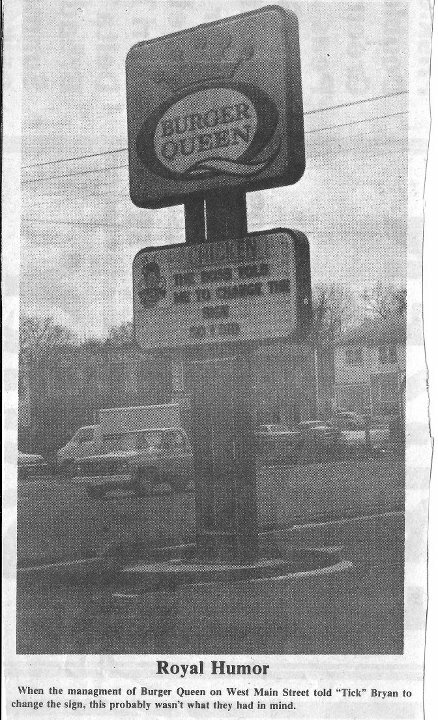 1989: Druther's begins communications with Dairy Queen in regard to possible conversion. 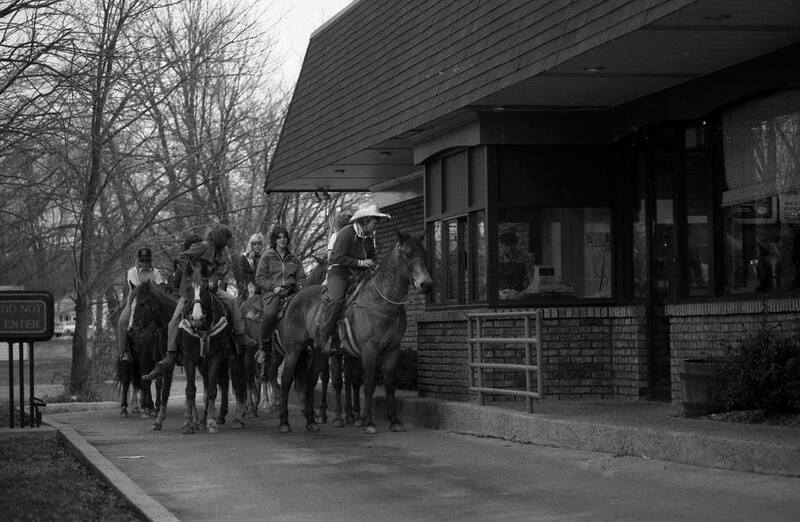 1990: Druther's agrees to become a territory operator for Dairy Queen® and converts 117 Druther's locations in five states to the Dairy Queen® brand. Our breakfast program, served since our Burger Queen days, is introduced to the Dairy Queen® system. 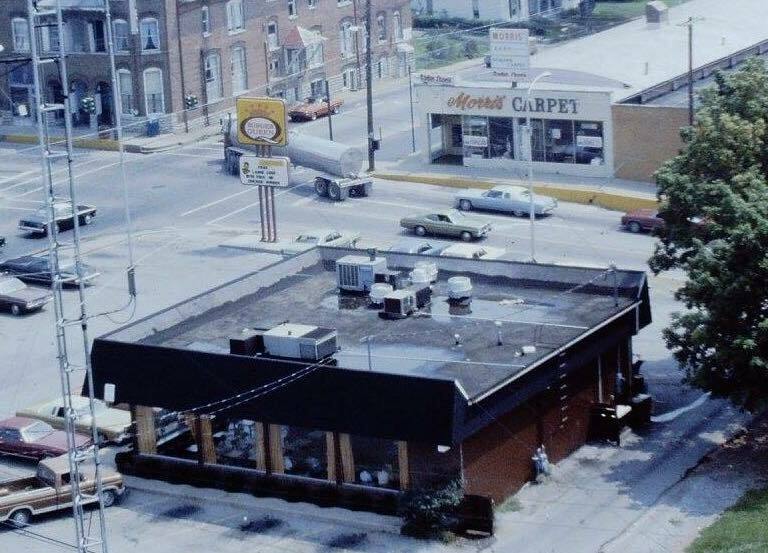 The few remaining Druther's Restaurants unable to convert due to proximity conflicts with existing Dairy Queens are allowed to remain independent Druther's locations. 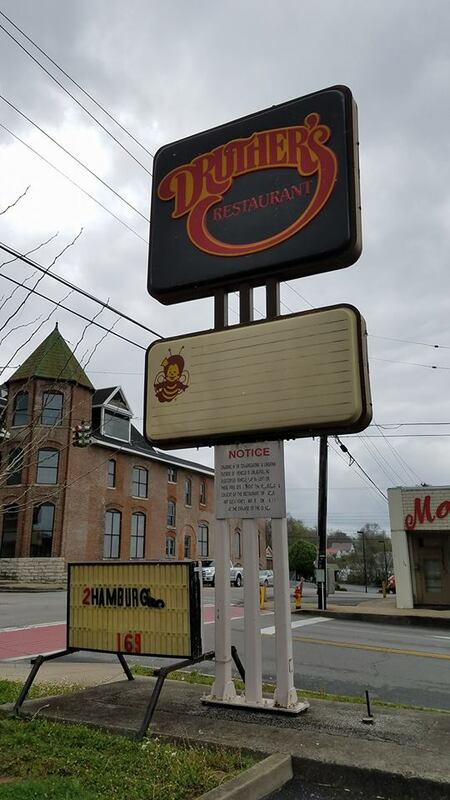 As of 2018, the last independent Druther's Restaurant in the world, a former franchise run by the second generation owner Steve McCarty, remains in downtown Campbellsville, Kentucky. 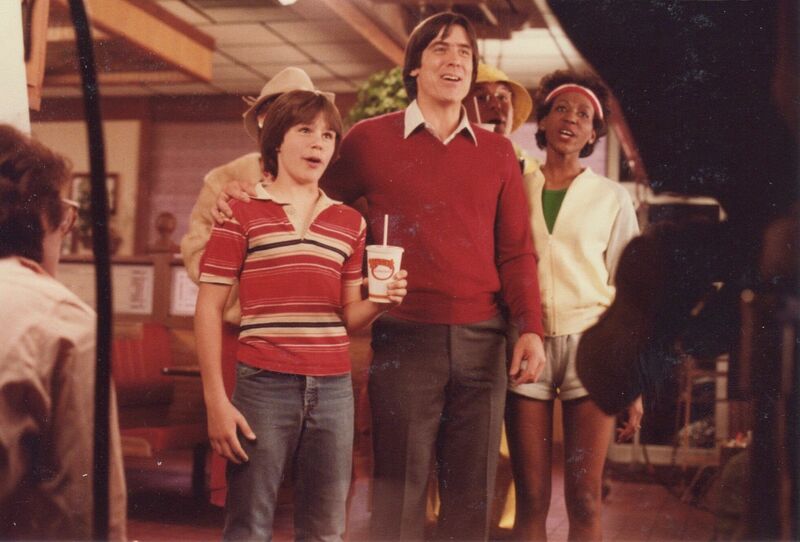 1991: The conversion to Dairy Queen® is completed. The "Druther's Phenomenon" within the Dairy Queen® system begins. We would rename Druther's International to Druther's Systems to better fit our role as a Dairy Queen franchise operator with over 100 locations. 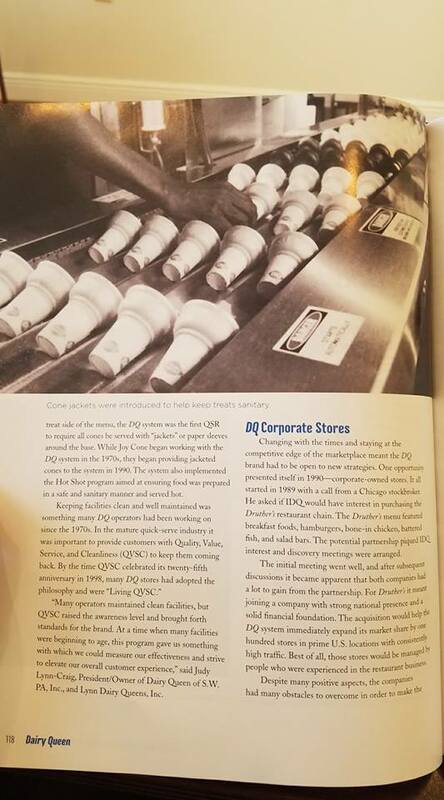 1996: Tom Hensley integrates numerous company locations with Dairy Queen® to create Dairy Queen Corporate Stores, bringing along several former Burger Queen and Druther's operators and executives. 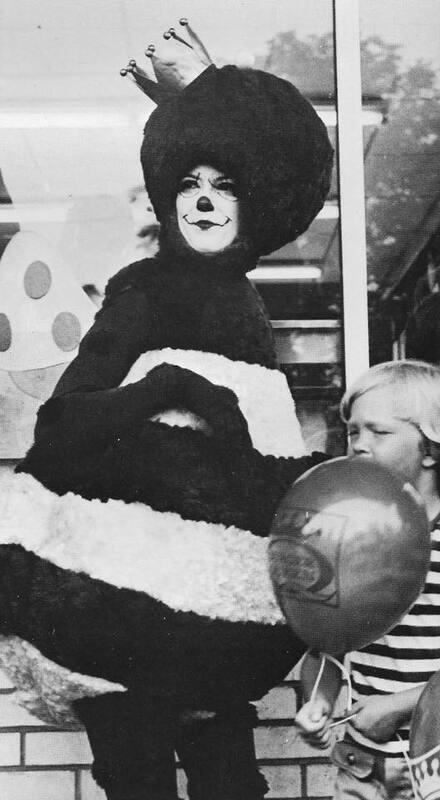 Hensley would become President of the new division within Dairy Queen. Druther's Systems remains operational with Robert Gatewood in control as President and operates alongside Dairy Queen Corporate Stores. 1997: Berkshire Hathaway and Warren Buffett agree to buy International Dairy Queen, Inc. on October 21st. 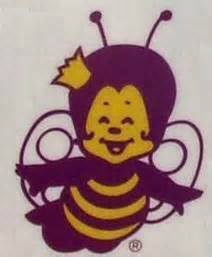 1998: Tom Hensley, former Burger Queen and Druther's President, as well as President of Dairy Queen Corporate Stores, passes away in Wyoming in November. 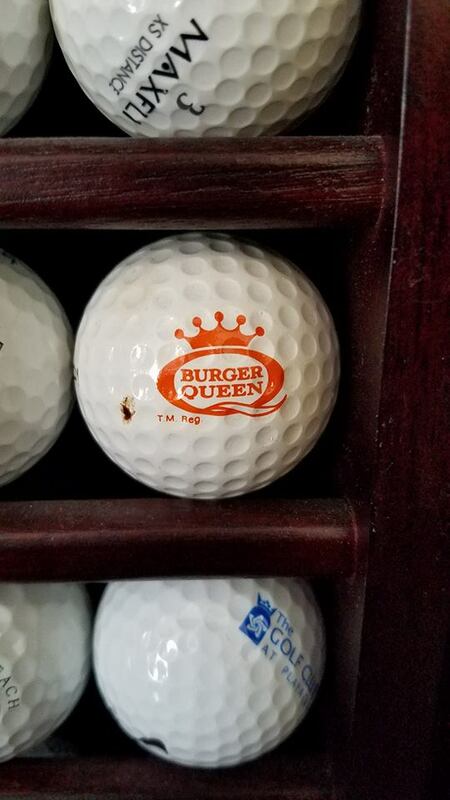 1999: Mike Kull, former Burger Queen and Druther's executive, becomes President of Dairy Queen Corporate Stores after the death of Tom Hensley. 2000: International Dairy Queen and a franchisee committee, including Burger Queen and Druther's alumni, develops the Dairy Queen® Grill & Chill® concept. 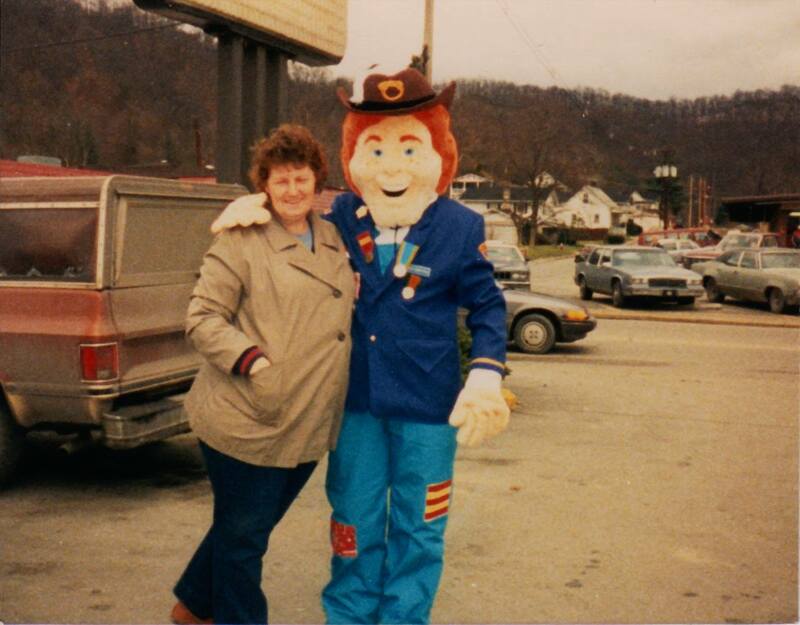 2001: The first Dairy Queen® Grill & Chill® model restaurant opens in Chattanooga, Tennessee. 2002: Dairy Queen® announces the DQ Grill & Chill® concept as the path forward for the company. 2008: John Gainor becomes CEO of International Dairy Queen, Inc. in July. 2010: Dairy Queen® communicates its intent to dissolve Dairy Queen Corporate Stores and put the locations put up for sale. Druther's is not approached regarding the purchase of our former locations. 2011: Former Burger Queen and Druther's executive Mike Kull retires as President of Dairy Queen Corporate Stores, as all company locations are sold off. Druther's is not approached by Dairy Queen® regarding our former locations. Several joint venture partners, former Burger Queen, Druther's and DQCS alumni, rejoin Robert Gatewood and Druther's as partners and take control of their locations in Indiana, Kentucky and West Virginia. 2017: Brian Easley, Robert Gatewood's son-in-law, comes on board as Vice President of Druther's. 2018: Troy Bader becomes CEO of International Dairy Queen, Inc. on January 1st. 2018: Druther's joins the Internet age, creates a website and joins social media on Facebook, Instagram, Twitter and LinkedIn. 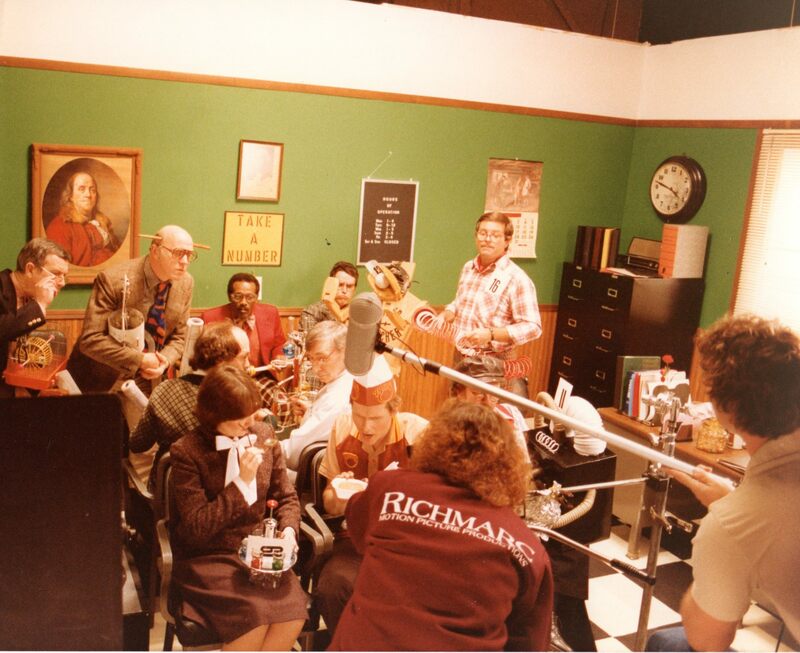 Easley begins research on the company, with the aim of publishing a coffee table book on the history of Druther's. 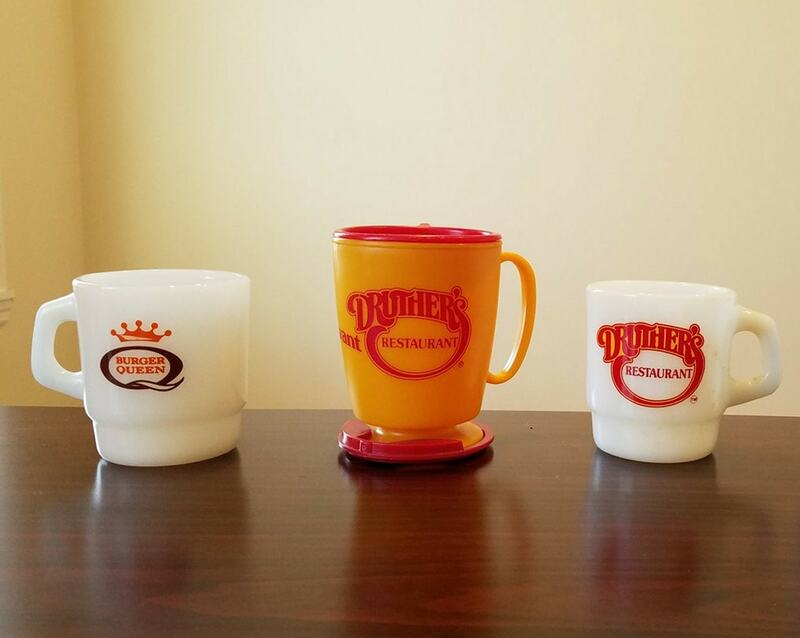 Druther's co-owns several Dairy Queen® restaurants in Indiana, Kentucky and West Virginia. 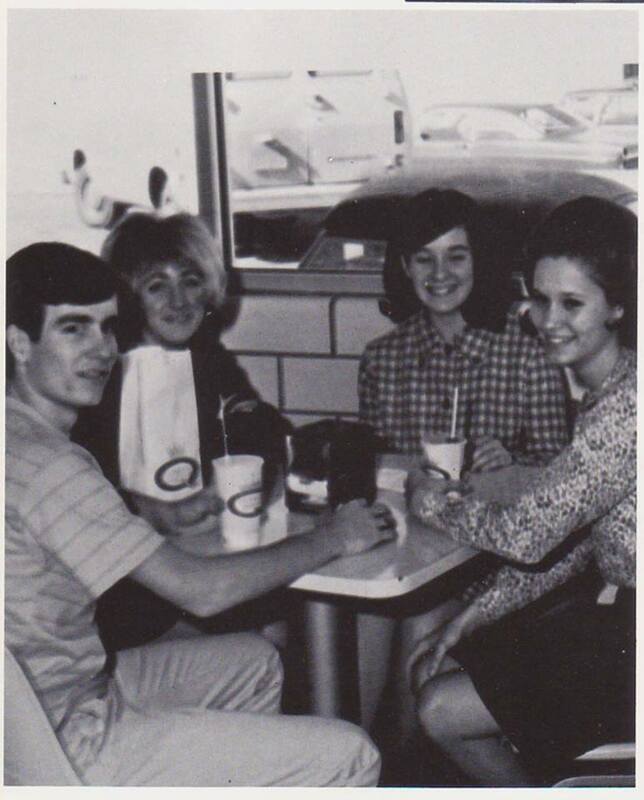 Robert Gatewood, the Gatewood family, and Druther's also own and manage several other Dairy Queen® properties in the region.